Every spring as the snow recedes and the temperatures warm up, something begins to happen. The trees wake up from a long cold Manitoba winter and a sticky sap begins to flow. Arborist Ken Fosty says maple syrup made from Manitoba maples is as good as that made in Eastern Canada from sugar maples. (Holly Caruk/CBC)This liquid gold is true Canadian candy, and a tree expert in Manitoba says maple syrup could be flowing in your own back yard. The maple syrup that most are familiar with comes from the sugar maple tree. That tree doesn't grow in Manitoba, but the Manitoba maple does. And they grow everywhere, along riverbanks, in shelter belts, and on wooded properties. Manitoba maples are so hardy some even consider them weeds, says Ken Fosty, a certified arborist. "They never die. They can be fragmented and storms can hit them, pesticides can hit them, and salts can do damage to them. But they'll still keep growing, so people associate that wonderful trait with being a weed," says Fosty, who's been tapping maples for nearly thirty years. Fosty sees these trees as a delicious and underappreciated resource. "It's a secret that not too many people know about, but Manitoba maple syrup is just as good as sugar maple [syrup] that's tapped in Eastern Canada," he said. He says now is the season for tapping. "Sap flows when daytime temperatures are above zero, and nighttime temperatures are below zero," he said. Depending on the temperatures, sap can flow from March until May. Fosty says yields vary from tree to tree with some trees delivering up to eight litres of sap. It must then be boiled down, but it takes a lot of sap to make syrup; 40 litres will give you just one litre of syrup, Fosty says. Ken Fosty says says now is the season for tapping, with daytime temperatures above zero and nighttime temperatures below zero. 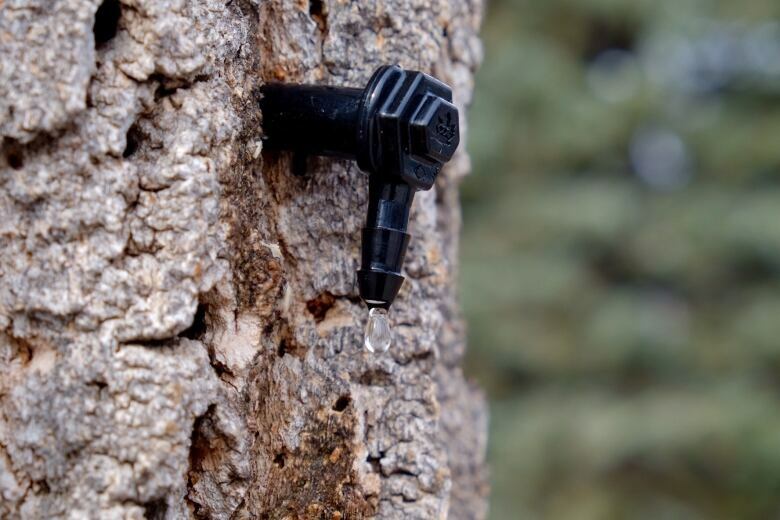 (Holly Caruk/CBC)Tapping can be done year after year without hurting the tree, he says, so long as the tap is moved around and the tree is big enough to sustain a tap. When the season is done, the tap is removed and eventually the tree will close up the hole on its own. Fosty says it's a great way to enjoy the season and get outdoors, and be rewarded with a sweet treat. "It's sustainable and it's seasonal and it's a lot of fun," said Fosty.